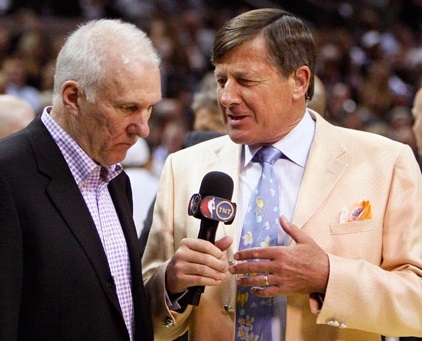 April 24, 2014 - Craig Sager, who some call an institution of TNT's NBA coverage, has been battling leukemia for sometime and as such was missing from TNT broadcasts since April 10. His son, Craig Sager, Jr., who has been filling in for him on the sidelines, did an interview with San Antonio Spurs coach Gregg Popovich. Popovich, who is not known for being very patient during interviews, stated, "Craig, we miss ya. You've been an important part of all this for a long time, doing a great job. We want your fanny back on the court, and I promise I'll be nice." Sager, a Lifetime Member of ASA, stated from his hospital room in Atlanta, "It was just fabulous, an uplifting, tremendous thing for me. Pop saying he wanted me back and then promising to be nice. That's unbelievable," Sager said. Sager has been receiving a series of chemotherapy treatments while staying in the hospital's blood and bone marrow unit. But that didn't stop him from looking fashionable. "I am wearing a Captain America gown and lemon-colored socks," stated Sager in his usual humorous style. The TNT reporter expects to be hospitalized receiving treatments for at least four weeks.